Pedernales Falls State Park, Texas. A sign sits atop a graveled path: WARNING - The Pedernales River running through the park can flash flood with little or no warning. The water in the river can rise from a placid stream to a raging torrent in a few minutes. If you are in the river area and notice the water beginning to rise, you should leave the river area IMMEDIATELY. Texans know firsthand how the mood of Mother Nature can change in an instant; this sign near Pedernales Falls is just another reminder of that. At Pedernales (pronounced “Per-denales” by locals) Falls State Park near Johnson City, it is not uncommon to instantaneously see pristine blue skies morph gray or to see powder-puff white clouds transform into rolling herds of smoking whisps. Climate often changes in an instant, creating changes in the landscape. But that is part of what makes Texas so unique. And this is precisely what brings so many visitors, year-round, to one of the “perdiest” expanses of country in central Texas. 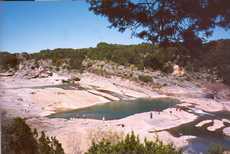 Pedernales Falls State Park spans over 5,200 acres of land in Blanco County, including land along the scenic back of the Pedernales River (the same river that runs near former President Johnson’s boyhood home). The state of Texas opened this natural retreat to visitors in 1971, making camping, hiking, swimming (seasonal), tubing (seasonal), biking, and fishing available to all. The falls themselves, however, are what really draws visitors to the park. On any given day, visitors young and old, from near and far, can be seen exploring the expanse of the falls. When no recent rain has occurred, the falls serve as a serene escape for weary travelers, a calming cove offering visitors a place to relax. A fifty-foot overlook accommodates the timid; a trail of descending rock steps entices the adventurous, leading directly into the valley of the falls. 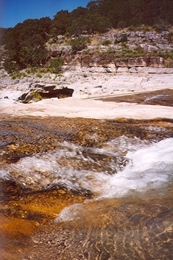 The falls are created by a natural, downhill layering of limestone. 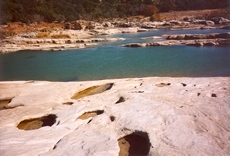 These river limestones result from the 300-million-year-old Marble Falls formation and are part of the southwestern flank of the Llano uplift. Water flows steadily through the falls year-round, but after heavy rains, water cascades across this 3,000 feet of natural barrier, creating a ferocious surge of water, woods, or whatever else might get in its way. Flashfloods are frequent and dangerous in this area, with little natural warning. Flooding occurs almost instantaneously through the wide-mouth falls of the Pedernales when Texas-sized drops of rain begin to pour down. Nature now creates another scene, this one a bit unwelcoming but no less a sight to behold than the first. Still, visitors flock to this area, whether tame or treacherous. Both are fine examples of biological beauty; however, the falls offer more hands-on exploration activities when the water level is low. After any flood, loads of soft sediment are deposited along the riverbanks, creating a beach-like “shore,” with yards of warm, golden sand extending beyond the width of the river. This rural beach is even complete with the displacement of various rocks and shells perfect for collecting. With each flood, the shore is washed away and replaced, in a perpetual cycle of old and new. 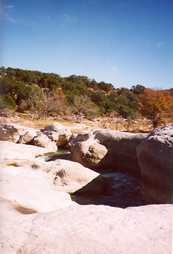 Normally, these falls are a restful ravine, where a quiet trickling of water snakes through the rocks, reclines in cesspool crevices, and continues calmly down the Pedernales. The exposure of the limestone as the water folds beneath them reveals, quite simply, large rocks, which appear foreign and out of place among the ash, buttonbrush, and cypress landscape that peppers the adjacent river terrace. The rocks are easily accessed opposite the sometimes-shore of river sand. During periods of calm, the rocks become a giant playscape, with children and adults alike jumping from one to the next, hoisting themselves over and through the craters that look not unlike bestial footprints. With jeans rolled up, toes taste the cool, blue water, wind tickles fingers, and eyes squint to avoid the sun. Children wade while dogs paddle. Families picnic, and friends photograph. Brothers skip rocks along the bank. A grandmother collects shells. A Labrador chases a walleye between the rocks. Teenagers sunbathe. Some just sit. Breezes blow crosswise through the falls. Crappie, bass, catfish, channel cats, and sunfish dot the water. Oak leaves fall from swaying trees. Acorns drop--then sink--into soft soil. Insects create a natural symphony. All that surrounds the river is in a constant state of flux, forever prisoner to the cycle where one scene is replaced by another as weather changes from rest to rage. The river, quite old, becomes new again several times each year. Sometimes, even the visitors, too, exchange their old views of beauty and serenity as they experience nature anew. Maybe this is why they come: for a refreshment of sorts courtesy of one of central Texas’ most picturesque alcoves. Whatever the reason, the falls are a welcoming beacon among the otherwise harsh terrain of the Texas hill country, tempting visitors to taste of its waters, to eat of its milieu. 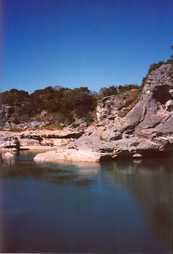 The falls area is at the far west end of Pedernales Falls State Park, which is located nine miles east of Johnson City on FM 2766. The park is open seven days a week year-round, except when park wildlife management activities force closure of all or part of the park.